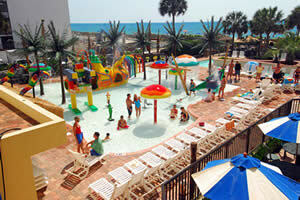 Myrtle Beach is considered the top family beach in the United States for a good reason. With plenty of attractions and events designed especially for families with children, kids can have the time of their lives while parents can relax and join in the fun. If you're planning a Myrtle Beach vacation with kids in tow, you'll want to choose a Myrtle Beach hotel that offers plenty of family-friendly amenities and fun-filled activities to keep the kids busy. Most hotels in Myrtle Beach offer at least one swimming pool and many offer multiple pools, jacuzzis, lazy rivers and water parks. Your best bet to entertain the kids while at the hotel (if you have younger kids) is to choose a resort hotel that has a kiddie pool (which many of them do). 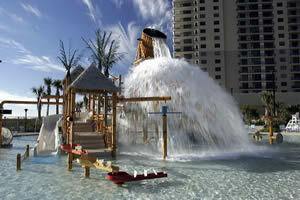 If you're bringing older children, try to find a family-friendly resort in Myrtle Beach that offers amenities such as free Wi-Fi, game rooms, water parks and lazy rivers or that is in close proximity (walking distance) to exciting Myrtle Beach attractions-- just make sure that you have a clear communication plan setup with your children before allowing them to take off on their own. There is no shortage of family-friendly attractions to experience while on your Myrtle Beach vacation. If your kids are interested in animals, check out attractions such as Alligator Adventure, Ripley's Aquarium, or the Waccatee Zoo. If your children are more interested in thrill-seeking, consider visiting WonderWorks or the brand new Myrtle Beach Zipline Adventures located on the former site of the Pavilion. Fun in the sun is a must in Myrtle Beach, so also consider visiting mini-golf courses, state parks, the ocean, and amusement parks such as Family Kingdom and Wild Water & Wheels. In the evenings, Myrtle Beach offers plenty of shows that are perfect for the entire family. Shows such as Medieval Times and Pirate's Voyage are sure to capture and hold your child's attention while providing some great entertainment for parents as well. If you're ready to begin planning a family vacation getaway, check out these vacation deals for the Guaranteed Best Rates on family-friendly hotels in Myrtle Beach!